Plans and sections roughly to scale showing proposed reconditioning. 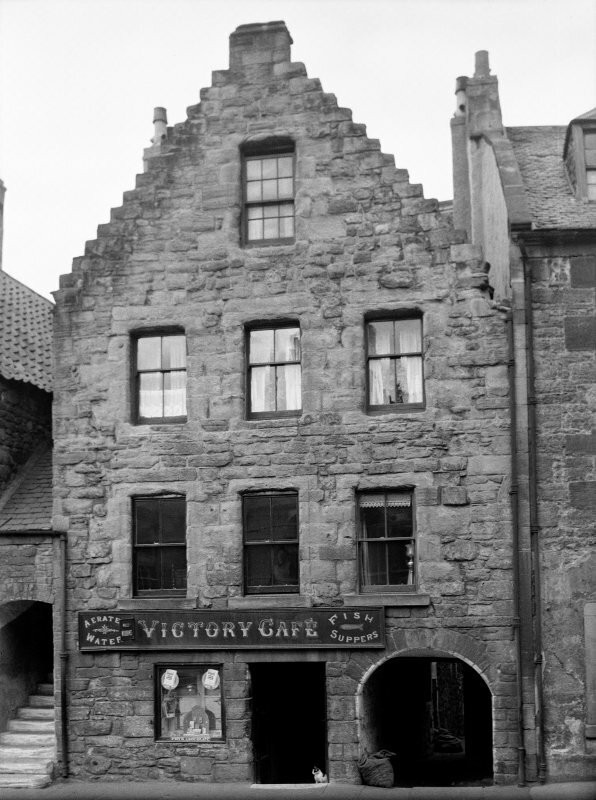 View from SW of High Street, Linlithgow. 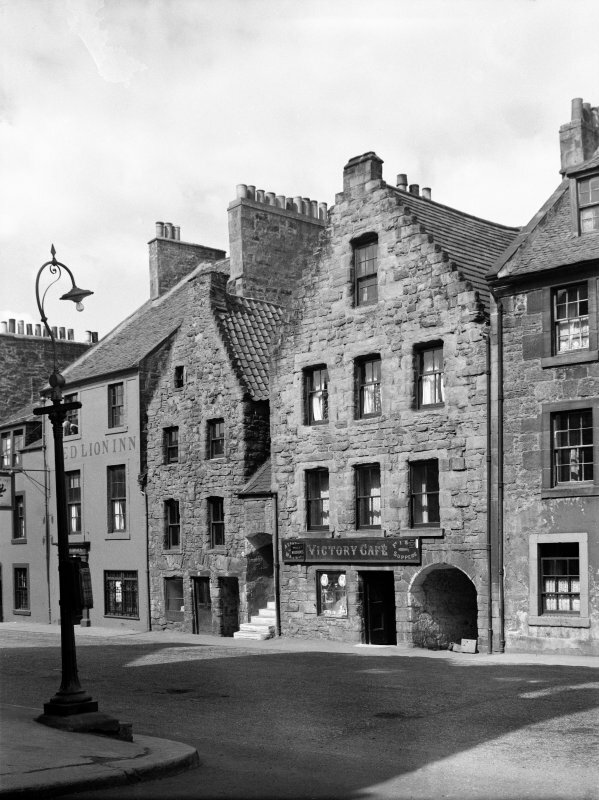 Town houses of the Hamiltons of Pardovan and Humbie restored, 1958, by the National Trust for Scotland as part of the Little Houses Scheme. 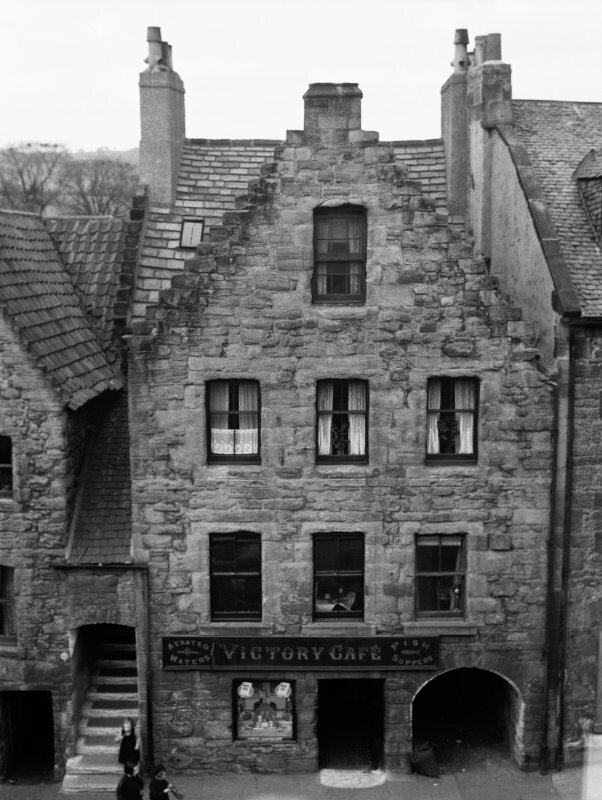 Twin crowstepped gables to the street linked by a covered stairway rising between to the principal floor. Stone and pantile roofs. Projecting window margins of No 42-44 reveal it once was harled. The gable of the other has a doocot. No 46-48 retains a bread oven in the yard behind. Nos. 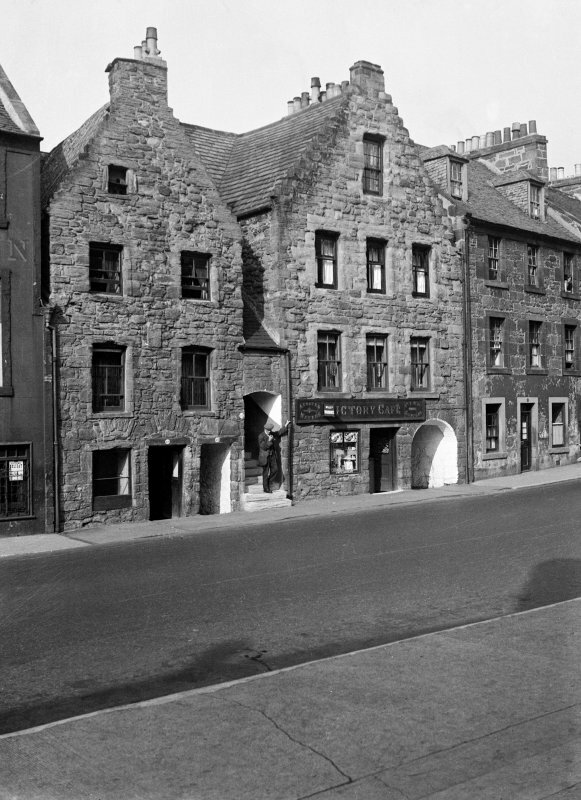 38-40-42-44-46-48 High Street, Linlithgow are all of 17th century date, rubble-walled, and three storeys and an attic high. 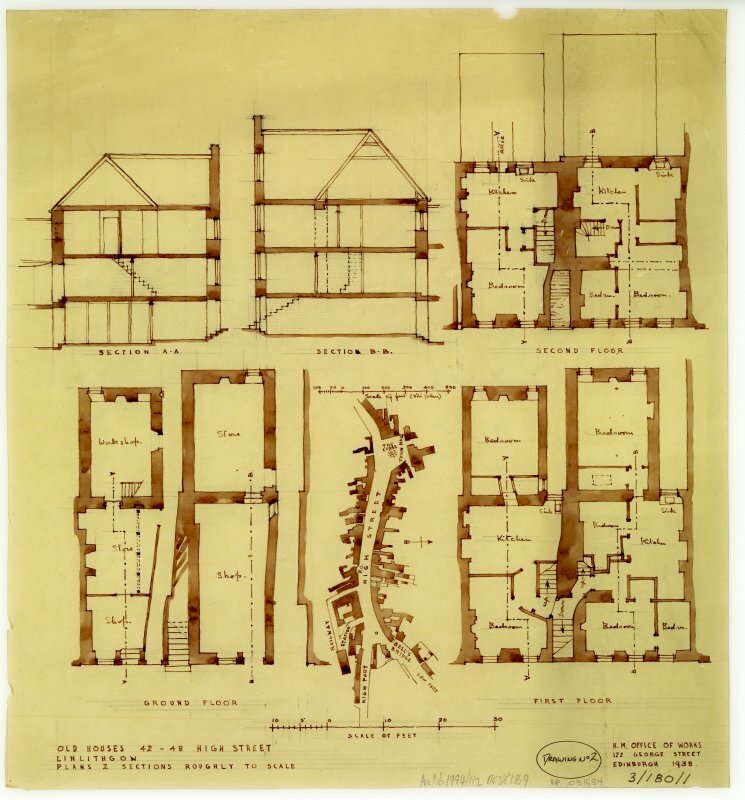 Non-Guardianship Sites Plan Collection, DC28188 -DC28189, 1938. 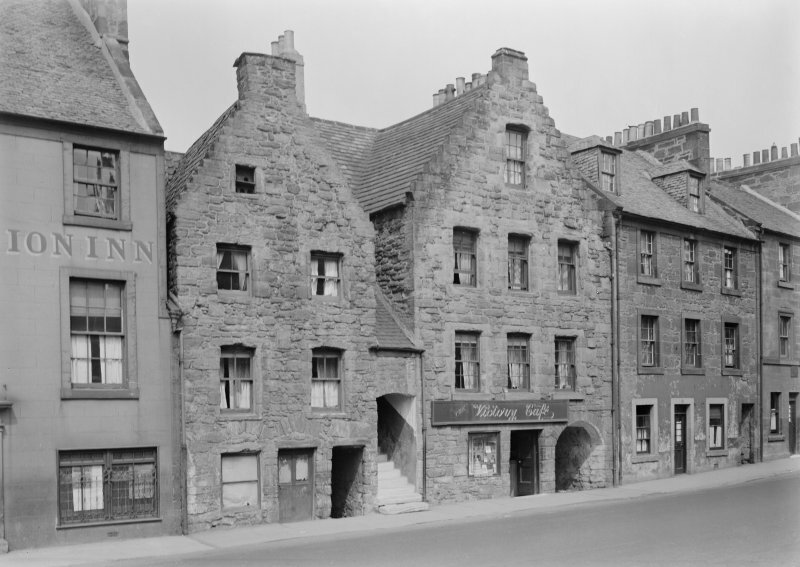 The Hamilton Lands figure 11 at 40-48 High Street, built for the Hamiltons of Pardovan, give clues to domestic buildings typical of Linlithgow's sixteenth-century main thoroughfare (seep 20), with crowstepped gables and, at Nos 44-48, a flight hole for pigeons. 40-42 is stone-slated and has a round arched pend leading to its back.lands, which are now developed. The two houses are joined by a stair with its own pantiled roof 44-48 is pantiled, with a narrower pend leading to a sixteenth-century stone oven at the rear of the property. Although this has probably been much renovated, it is a reminder of the importance of avoiding fire risk when so much housing was totally or partially of wood. Also, a strong visual comment on the importance of back.lands is the circular beehive-shaped doocot, with its 370 nest holes, which housed an alternative food supply for the family of Ross of Halkhead. 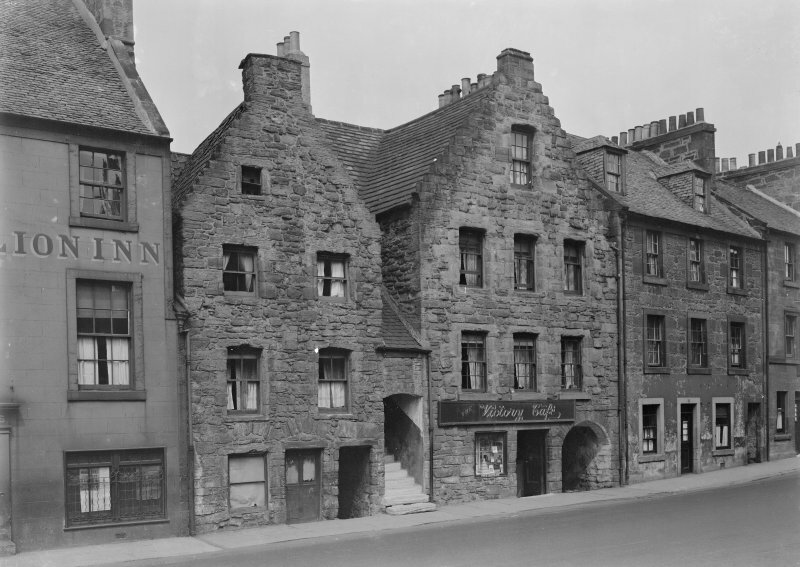 The National Trust for Scotland commissioned Alder Archaeology to carry out a Historic Building Recording on the roof at 42-44 High Street, Linlithgow which is part of a group of 16th century buildings known as Hamilton's land. The requirement was to record the nature of the original roof as it was exposed during essential repairs. The sarking was found to comprise pit-sawn Scots pine planks of a variety of lengths and widths. Stone slates had been attached to it using large headed hand forged wrought iron clout type nails. The roof itself was found to be of common rafter form with most of the original rafters surviving, though a few had been reinforced or replaced with new rafters in the 19th or 20th century. All original timbers were found to be adze trimmed softwood, probably Scots pine, and most were whole though some were halvedand a few quartered. Rafter pairs were connected at the apex with pegged mortise and tenon joints. 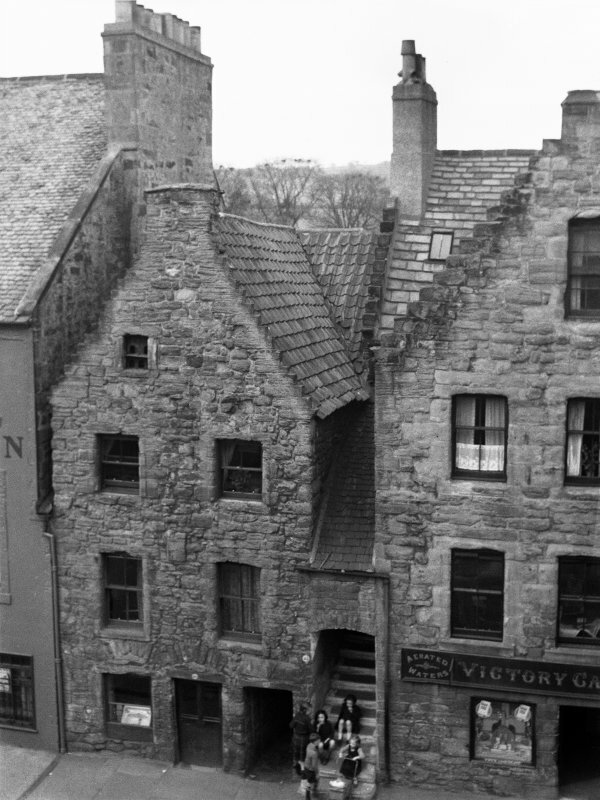 Differences in collar widths and assembly marks suggested that the N roof may have stood alone prior to the construction of the S. This pointed to the possibility that Hamilton's Land was at one stage set back from the High Street. It is hoped that future dendrochronology of timbers will be able to provide precise dates for the two roofs and further clarify the precise building sequence.